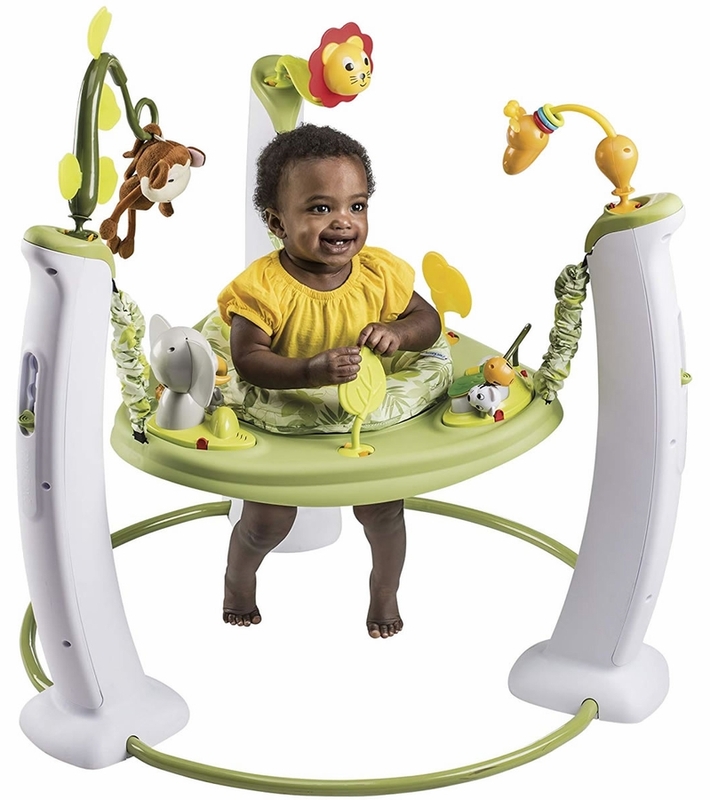 I looked far and wide for an exersaucer and finally landed on purchasing this one and it does not disappoint! Setup was pretty straightforward and adjusting the seat height was easy too. At first my son was a little confused by it but a day or so later he loved being able to sit/stand with so many toys surrounding him. Plus having the toys on the poles are really cute. The leaf/mirror toy I had to remove because my son kept trying to put it in his mouth and hitting his mouth on it so I'll have to wait until he stops doing that. The only other improvement I can see are better musical and light elements on the bigger toys. The elephant toy only makes a pitter patter sound and I think it could've been much better. Overall I liked the item but I think some improvements could be made to the toys attached to the saucer. Bought this for my first grandchild 3 years ago. She loved it for the musical parts. Now my grandson (6 months) is loving it for the jumping! He plays with all of the animals and really likes to flip the pages in the book. Although it is big and not easy to move from room to room, I feel secure that he is not going to tip it over with his enthusiastic bouncing. 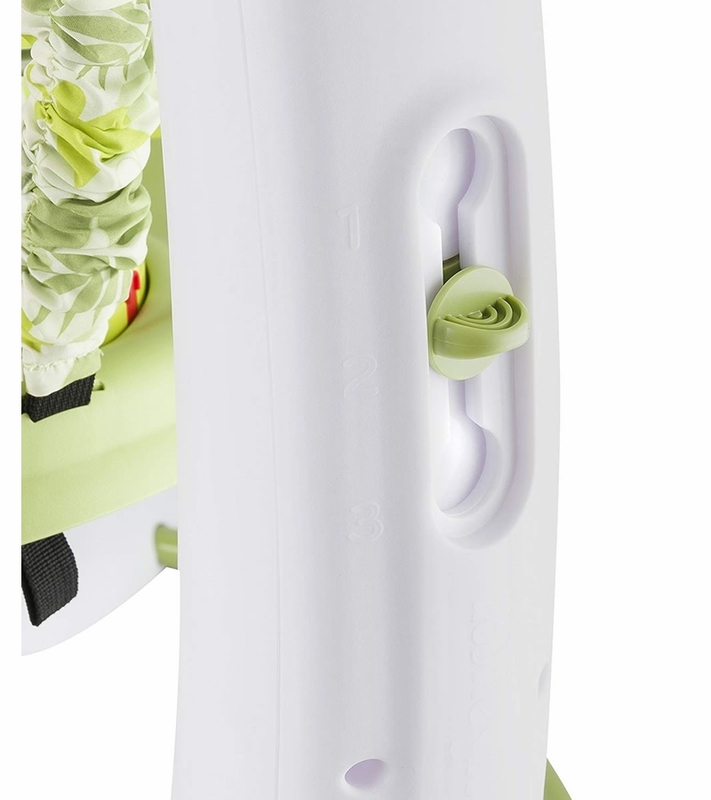 - Height limit of 76cm - my 5 & 1/2 month old is 74cm, so I'll be lucky to get a months use out of it. - There are two empty stations - for the price, I would expect toys at all stations, not a plug and empty tray. 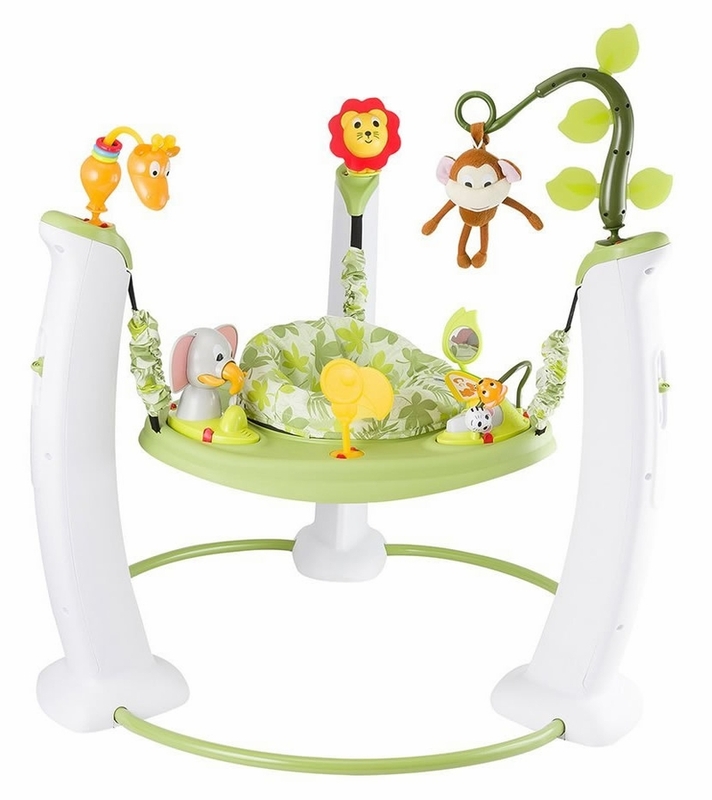 More dangling things like the monkey would be good, and an activity they could roll or jingle without batteries would work in the empty tray. I'm glad I bought this second hand, it's not worth the price in Australia. 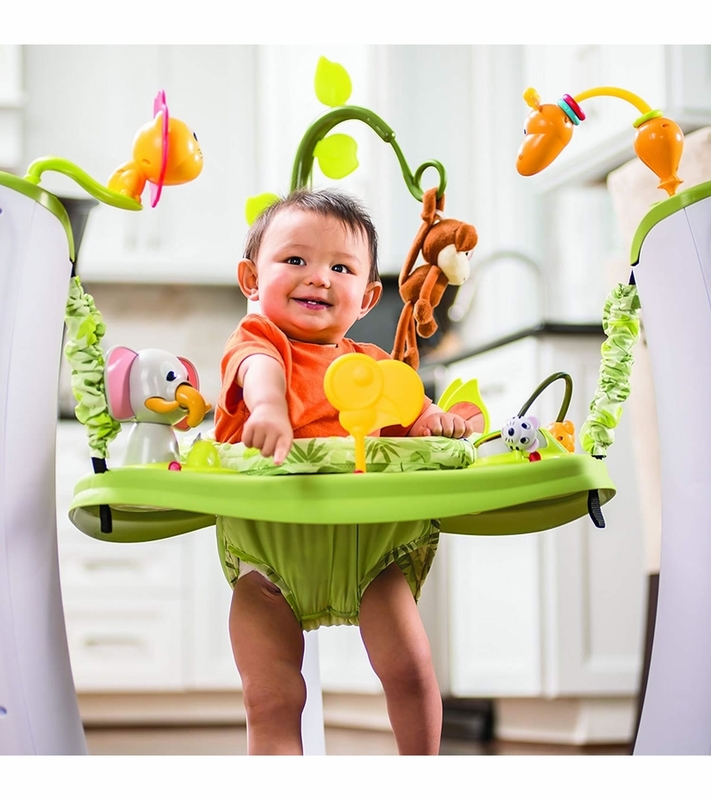 My son really loves it, and so do his little friends that have tried it, but I'm disappointed with a few things, including: - Height limit of 76cm - my 5 & 1/2 month old is 74cm, so I'll be lucky to get a months use out of it. - It's impossible for him to spin himself - The mirror is too low - The lion is too short to be reached and doesn't work down low - The giraffe only works down low - The yellow bird is of no interest to my son - There are two empty stations - for the price, I would expect toys at all stations, not a plug and empty tray. 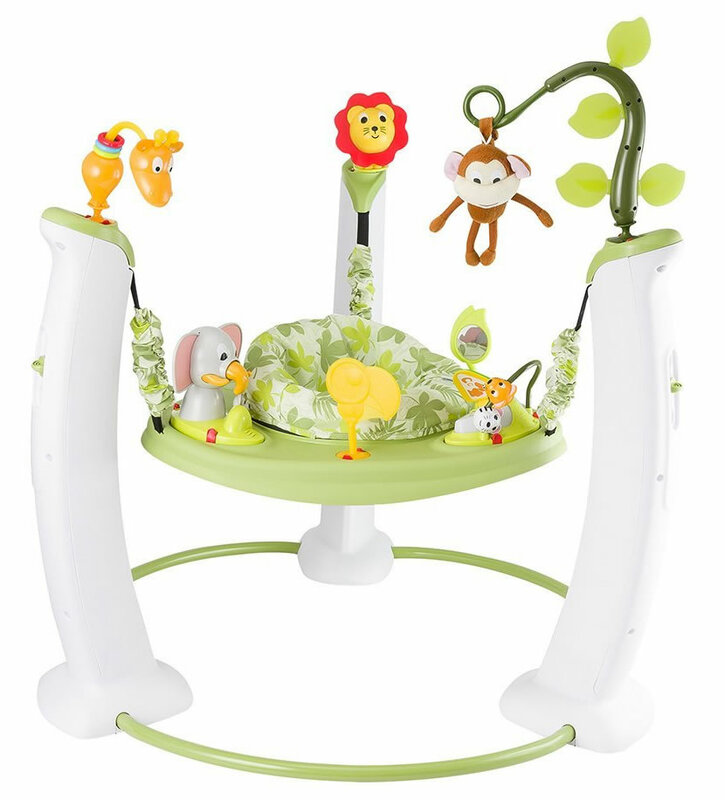 - Takes up a lot of space More dangling things like the monkey would be good, and an activity they could roll or jingle without batteries would work in the empty tray. Both of my children loved this jumper. My son was never really interested in the upper level of toys but my daughter loved them once she was big enough to reach them. It is a great toy to put them in while you try to get stuff done around the house. And it is fun for the parents to watch the babies jumping. So cute! My husband and I bought this when our son was four months old and he still uses it at 11 months. He enjoys playing with all the toys and loves he jumping aspect the most. 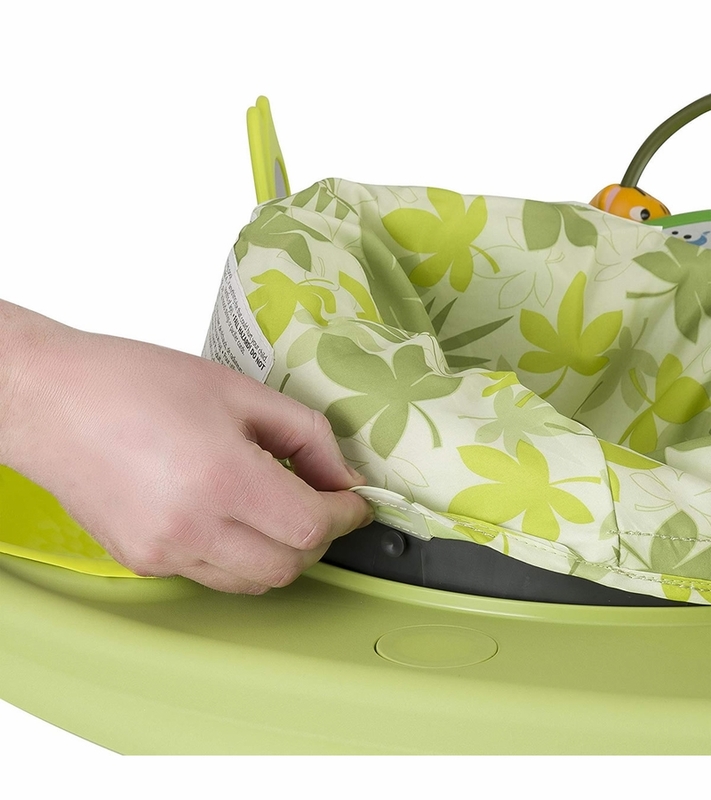 We love it because it gives a safe play area for our son. My only complaints are that the lion toy is not very interchangeable since it sits too low to spin on the lower level. My son gets frustrated that he can't reach high enough to play with it on the upper level. What is the maximum weight and length?